Winter swirled back with a desperate last bite, and flung snow and ice with unending fury. We are smothered again in her white cloak, colour and life bleached from sight. Most peopled groaned and sighed “not again”, but all I could see was sparkling new beauty, and amazing shadows. This wasn’t a repeat, an old rerun of an often watched show, this was brand new footage. 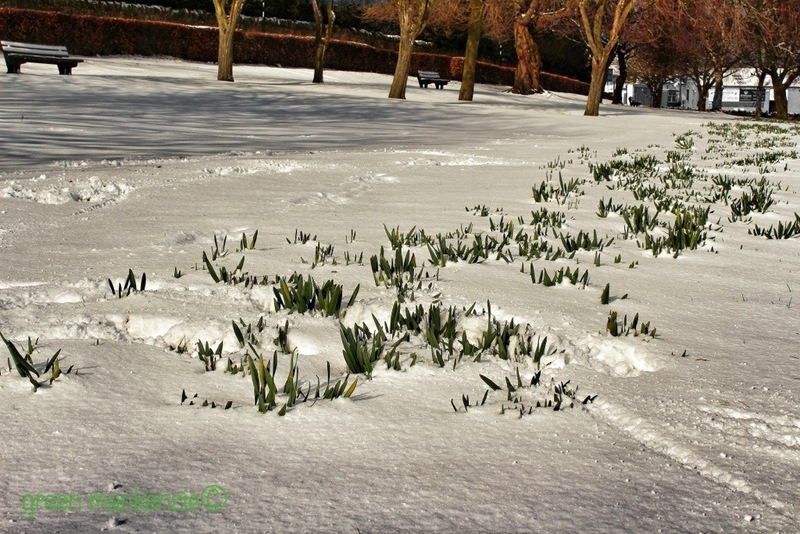 Look a little closer and you can see the daffodils, thrusting their green and yellow spears up through the snow. They are making their first appearance of the year on a stage of snow. 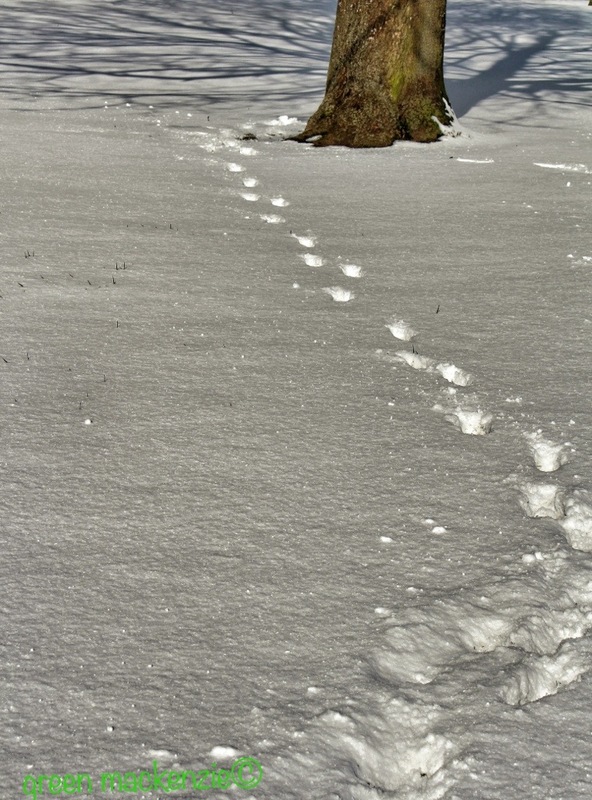 Let yourself follow this fresh trail of prints, crushed into the snow, and showing for one day only. They’ll never be seen again, and will soon have been obliterated or melted. We can let the world show us new paths each day, or we can sigh and assume we’ve seen it all before. We can let our mind be filled with assumptions that the snow is a cold, messy inconvenience….or we can open our mind and let the real experience flood in. For a while at least, it paints the familiar landscape with the sparkling magic of ‘now’. These fragile crab apple blossoms are positively glowing in the new snow, and are yet another reminder that time hasn’t slipped back. Things are still moving forwards towards spring and colour. I think we often let the feeling of something being repeated feel like a negative move backwards, but reality is always growing forwards into something new, backwards is just a trick our mind plays on us. Don’t let yourself be fooled. And if you don’t believe me let the new blossom tell you about the growing strength of the sun. This entry was posted in change, mindfulness, philosophy, photos, stuckness and tagged change, growth, life, mindfulness, musings, nature, photography, relaxation, spiritual. Bookmark the permalink. …great minds think alike, and all that? What a refreshing reminder. I am so ready for spring that I was angry at the snow. I had to cover my blooming hyacinths and other fragile spring plants. But you are right, it is a beauty that is the only one of its kind. Those particular flakes will never blanket the same again. Thank you for the reset, I needed it. Great photos! Your welcome Janine….it’s so easy to get swept out of the present and into a list of things to do filled with resentment 🙂 I do it all the time, but snow always works its magic on me! I really enjoyed looking at these photos of your (hopefully) last snow. Your narrative added to my joy also. Thanks Pat, I’m glad you enjoyed the words. :-) I can never resist a little story to go with the images ! Me, too. Let’s agree to keep the words rolling. I am finding that most of the time I enjoy just a brief story about the images on other blogs so that is what I aim for. I think I really enjoy the human connection. Wonderful images–really delicious colors! Excellent processing. Such beautiful snow shots! 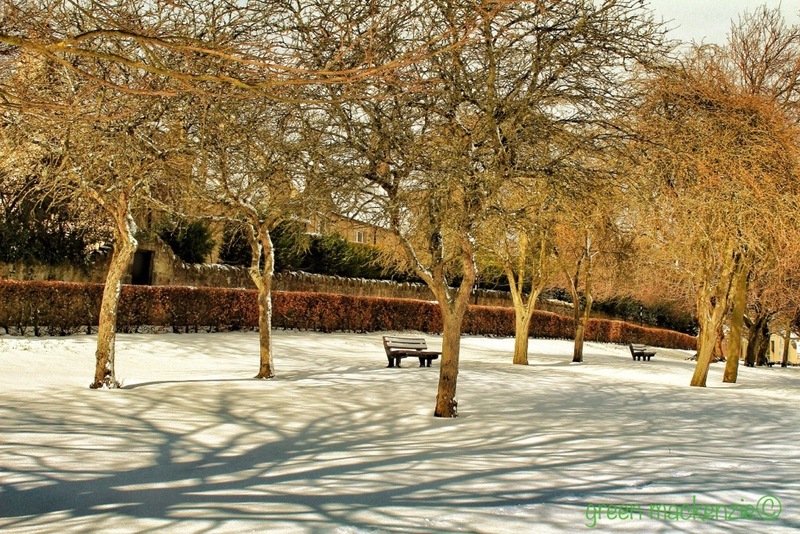 Late winter snow is so uplifting and lovely, especially if you already have flowers in bloom. Beautiful photographs with equally beautiful prose…thanks. Lovely. 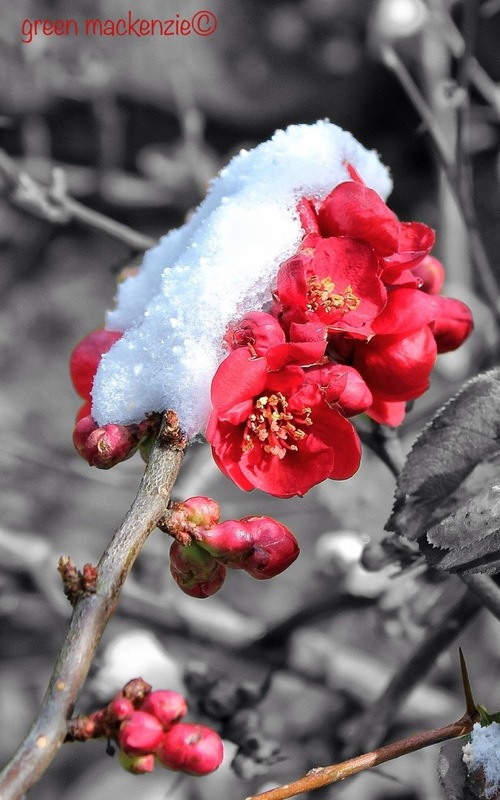 I was living in Gotemba, Japan, and I woke up one early spring morning to a surprising couple of inches of snow. The orchards and daffodils were already in bloom and I knew the snow wouldn’t last more than a couple of hours, so I grabbed by camera and went out and got shots pretty similar to some of these. A very special circumstance. Thanks for sharing. Thanks, I was really happy with the way that first shot turned out….the sun was low, and bright and golden…giving great atmosphere. I used my favourite app called Snapseed to adjust colour saturation and texture. It’s one of my favourite processing apps. I process my photos on an iPad so that I can use these great apps, and still have a big enough screen to see what I’m doing! I’m a total covert now…they are so cheap. ……Snapseed was free….and so quick and easy to use. 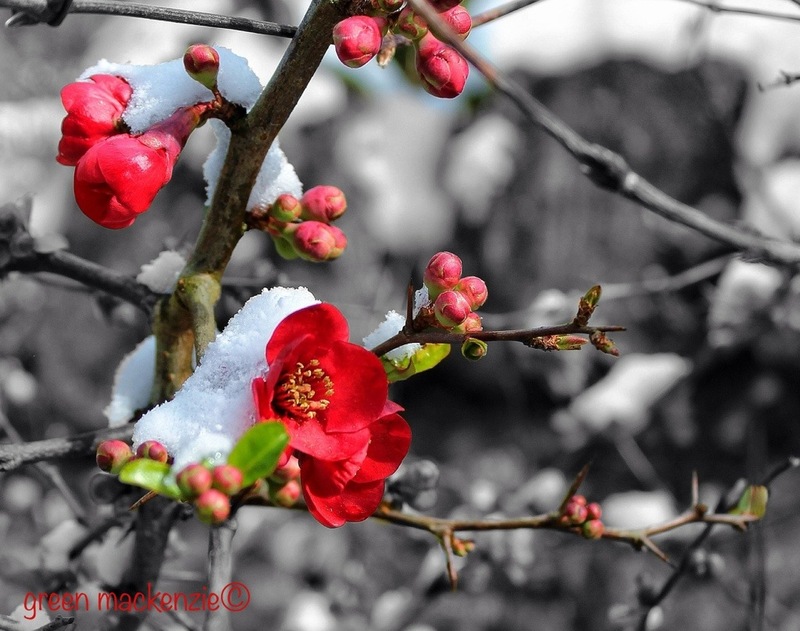 Thank you 🙂 I loved that bright pop of red against the white snow and bare branches!